1. Bite Beauty Agave Lip Mask $26- So thick but not at all sticky or heavy. I love this stuff during long rungs as my lips tend to get very dry. Trust me, this product will not disappoint. 2. Maybelline Baby Lips Dr. Rescue $5.99- I keep this in my drawer at work. It is moisturizing enough for daily application and since I drink a lot of water while I am at my desk, I do not want something too heavy since I am constantly reapplying. 3. Botanics Super Balm $6.79- This to me is like an organic version of the Rose Bud Salve. Use it all over for any dryness or soreness. The consistency is mushy which I actually find fun. It is just so pure that it doesn't congeal. 4. 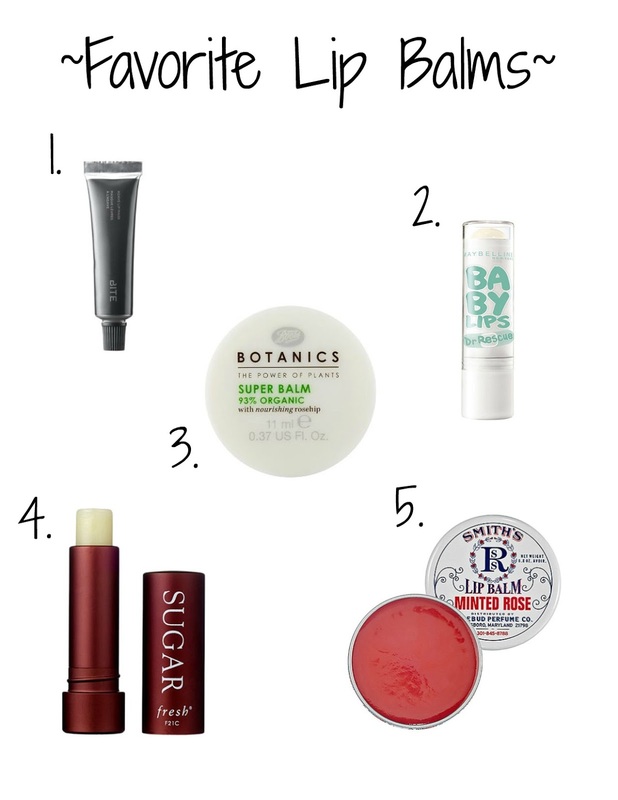 Fresh Sugar Lip Treatment $22.50- Another great daily balm. This actually has SPF 15 so I like to use it whilst running errands. 5. Rosebud Perfume Co. Rosebud Perfume Co. $7.00- This is something I carry in my purse and every time I travel. It is a multiuse balm. I use it on my kids, on my dog, on my cuticles. Just perfect to have around. Has the lightest hint of color but I honestly think it just enhances your natural shade more than anything. Which is your favorite lip balm? I just can't seem to have enough. I identify all too well with that scene in Napoleon Dynamite where he calls his brother to bring him his chapstick. Love it!